Jason Meyer. Preaching: A Biblical Theology. Wheaton, IL: Crossway, 2013. $16.73 (Amazon). 368 pp. Some of the best books on preaching contribute to the larger conversation with one or two insights that no other book seems to make. That’s why most preachers have several books on preaching on their shelves. Those who are familiar with evangelical preaching know that there is a “crisis” in preaching today. Preaching often looks like a collection of random Bible verses, some self-help advice, and cute stories. Jason Meyer, lead pastor for preaching and vision at Bethlehem Baptist Church in Minneapolis, has written a new book to fortify the evangelical church against this kind of preaching. 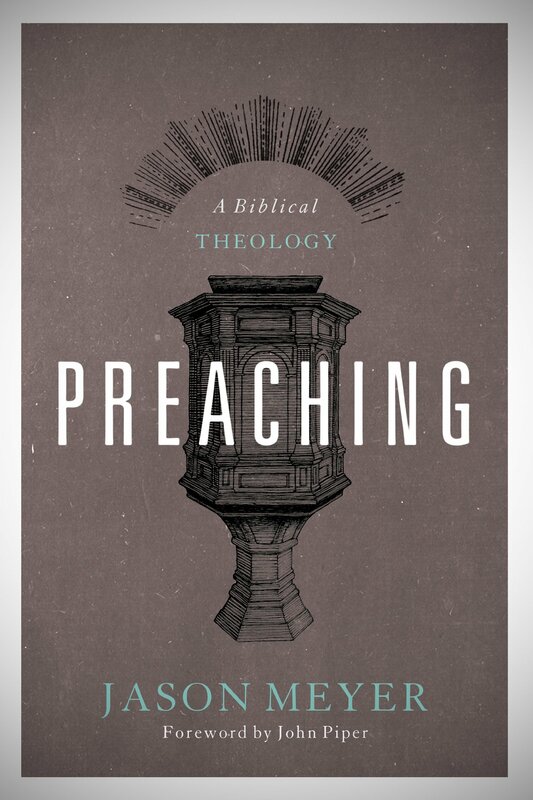 In Preaching: A Biblical Theology, Meyer has provided a wonderful addition to the preaching conversation. As the title indicates, the book is a biblical theology of preaching, or more broadly, of the ministry of the word. A “biblical theology” means that Meyer analyzes what the Bible teaches about Scripture as redemptive history progresses (e.g. the ministry of the word will look different in Genesis than in does in Isaiah or John). This is the vital insight Meyer adds to the preaching conversation. He knows this book is different. Appendix 2 was written to tell the reader why his book is different. The book separates into five parts. Part one covers a brief summary of the ministry of the word in Scripture. Part two digs into more detail and covers each epoch of biblical history. Part three addresses expository preaching today. Part four seeks to synthesize biblical theology with three elements of systematic theology. Part five closes the book with some applications for today. From start to finish, here’s what Meyer wants to accomplish: he wants to prove that “the ministry of the word in Scripture is stewarding and heralding God’s word in such a way that people encounter God through his word” (21, his emphasis). This is also Meyer’s definition of preaching. The “encountering” piece may either bring a sweet aroma of life or a stench of death. I think preaching can be defined many ways, and I find Meyer’s definition very helpful, particularly for my preaching ministry, for it encapsulates its primary components: faithfully handling the word of truth (stewarding) in order to passionately and appropriately communicate it (heralding) so that hearers come face-to-face with the living God (encountering). It’s these three “suitcases” that Meyer unpacks throughout the book. As Meyer moves through the history of redemption, he reflects upon each of the main stewards of God’s word, how they heralded the word, and what happened after the word was preached (or what happened after it was not preached rightly). Embedded in this reflection is a look at the call and fall narratives for the respective preachers. Meyer does this to reveal the biblical expectation of a true steward and herald will climax in Jesus Christ. Section three on expository preaching is perhaps the most immediately practical portion for the preacher/reader. Here Meyer discusses the what, how, and why of expository preaching. For those more inclined to topical preaching, I highly encouraging you to ponder chapter 19 on “Why Expository Preaching?” He argues that it is thoroughly and demonstrably biblical and he provides six arguments to prove it. Perhaps his greatest argument is that “God did not give us a topical [Bible]. He gave us specific books, such as Isaiah and Romans. We must give the a voice, not compile them into topics or ten-step plans” (279). For those who are already convinced of expository preaching, the what and how chapters will be helpful. What expository preaching should be is God-centered and gospel-saturated (251ff). In other words, preachers must exalt the glory and grace of God and always draw a line to the redemptive work of Christ from any text. How does expository preaching work? The preacher shares the point of the passage, shows why that is the point, and shepherds the flock to wherever the text leads (258ff). Finally, let me say that this is not just a good preaching book, it’s a good theology book. Section two on the paradigm shifts in the ministry of the word is theological gold. Meyer writes in the introduction that he knows pastors are busy, therefore he encourages readers to “choose their own adventure” by either reading or skipping over section two (14-15). You may skip it initially, but come back to it. This section, in particular, will not only help preachers get better; it will sharpen their theology (namely, their biblical theology). And that’s always a good thing for preachers. I plan on turning to this book for years to come, and I highly recommend it to you if you are a preacher or even if you are a curious sermon-hearer. Previous Post What Do ‘True Christians’ Believe about Homosexuality?